Liliana Cruz takes a huge risk with the powerful feminist messages she sends through her paintings exhibited in the halls of the San Luis Learning Center. Cruz reinforces the message behind today’s gender revolution by displaying a diverse group of women traveling different roads but with the same aim in mind – reaching their goals through hard work. feature women of different ages, cultures, skin tone and backgrounds. Cruz’s expert eye for detail conveys the idea of where most of these women are by showing what they’re wearing and doing. “There is more to it than the colors,” said Julie Floss, professor of Fine Arts at Arizona Western College. 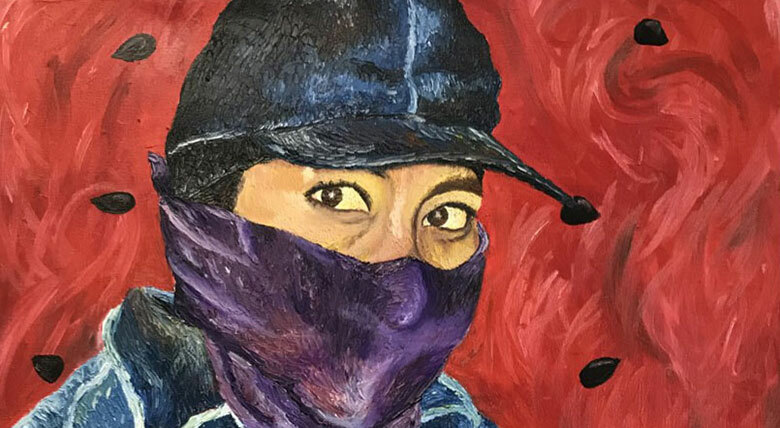 One portrait in particular that speaks to the community of San Luis is Watermelon, which shows a Latina woman wearing denim clothes, a cap and a purple bandana over her nose and mouth. The woman is carrying a watermelon while the portrait’s background is red with black dots, representing the inside of a watermelon. Cruz’s beautiful Life of Rosa is a portrait of an elderly Mayan woman with long dark hair. She is wearing a blue dress with flowers and, over that, a black cloak. The sunset behind her is orange, and a church stands in the middle of a field. Last but not least, Coco is a self-portrait of a Hispanic girl with tan skin color who is not afraid to show the beauty mark beside her lips. Although she may not be smiling, her white hair, thick nose and beautiful brown eyes show she is confident about her imperfections. Cruz, 26, was born in Oaxaca, Mexico, and moved to the border town of San Luis, Arizona, where she grew up watching hard-working women in the fields picking crops. These women left for work at sunrise and got back home an hour or two before sunset. In pursuing her artistic dreams, she eventually graduated from Northern Arizona University. At a time when more diversity is demanded in pop culture, upcoming artists are trying to meet these new demands, but not all of them are able to fully deliver. Cruz, however, forcefully delivers her feminist message with her realistic depictions of the journeys women from all over the world take to meet their goals. With that being said, with the majority of portraits with names such as Lizeth, Mi Viejita, Marina, Rosa, Lili and Jeny, the artist could have represented women from a couple of more continents. Apart from that, Cruz’s hard work pays off. Floss says that she will continue to exhibit meaningful art by talented artists in the SLLC. As for Cruz, she will continue to portray important messages on canvases. With talent like hers, the opportunities are endless.